When you hear Nobel carpets and rugs, you should know it’s all about beauty, class and excellence. Your number one home for floor décor in Nigeria is at it again. Do you have a flair for writing? Do you have a blog? Then, this is for you. We present to you an interesting opportunity to express yourself and a chance to get something fabulous in return. It’s the Nobel Bloggers’ Contest! Participate in the Nobel Bloggers’ contest which will be on from July 13th to 30th and you could be the lucky winner of cash prizes and many more. Isn’t that awesome? 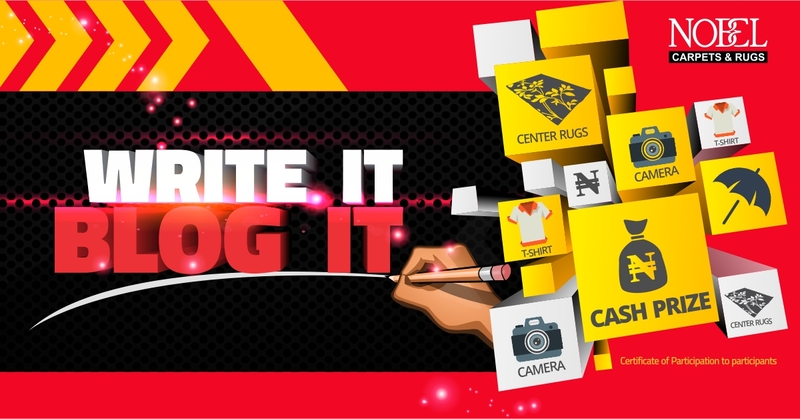 Write on the topic ‘Beautifying your home with Nobel carpets and rugs’ and publish it on your blog · Submit your personal details and blog url here- http://nobelafricablog.com/contest/ · ...and you could be one of our lucky winners. It’s that easy! Surprise Gift: All participants will receive assured gifts from Nobel Carpets and rugs We are looking forward to reading your interesting posts! 1.The blog content should be original. 2.The final date of submitting your blog entries is 29th July, 2016. 3.Winners will be decided by the internal jury of Nobel Carpets and rugs and their decision will be final. 4. All the blog entries will be a property of NobelCarpets and Rugs.